English Cocker Spaniel Dogs - The English Cocker Spaniel is a breed of gun dog. It is one of several varieties of spaniel and somewhat resembles its American cousin, the American Cocker Spaniel, although it's closer to the working-dog form of the Field Spaniel and the Springer Spaniel. 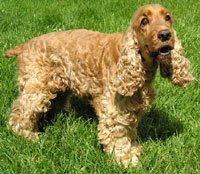 Outside the US, the breed is usually known simply as the Cocker Spaniel, as is the American Cocker Spaniel within the US. Due to the breed's happy disposition and continuously wagging tail, it has been given the nickname "merry cocker". This information is licensed under the GNU Free Documentation License. It uses material from the English Cocker Spaniel article on Wikipedia.org. English Cocker Spaniel Breeders - Advertise your kennel puppies and dogs here.